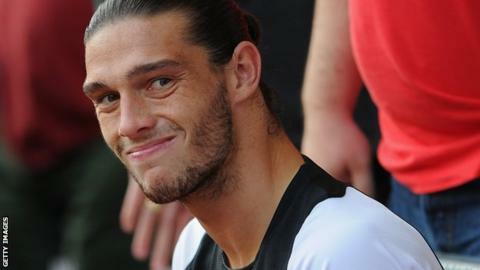 Liverpool striker Andy Carroll has joined West Ham on a season-long loan. The 23-year-old England international was persuaded to move after Reds boss Brendan Rodgers made it clear the player was not part of his plans. "It's great to be here at West Ham and all signed up," said Carroll. "I want to be playing games and obviously hoping to score some goals. "I know the manager well and some of the lads, so it is nice for me to come to a place where I know people." Carroll played under West Ham boss Sam Allardyce at Newcastle United. The forward also played alongside Hammers skipper Kevin Nolan when they were at the Magpies. "I know Sam from Newcastle and he was a massive reason for me coming," added Carroll. "It was a no-brainer really." Allardyce said: "For all parties, this is a great signing. Andy is an all-round footballer but, because he is 6ft 3in and one of his strengths is his aerial power, everybody dismisses the ability he possesses on the floor. "Hopefully he can score goals for us and we will be in a very good position at the end of the year in the Premier League." It is understood there is no commitment from West Ham to buy Carroll, although the Hammers have the option to complete a permanent deal for an undisclosed fee next summer. Liverpool manager Rodgers said: "It is very simple. The club have made a monumental investment in big Andy. At the moment he is not playing. He made it very clear he wanted to play games and this is his last chance to do that." Having conceded defeat in their chase for Carroll earlier this month, West Ham were given signs of encouragement on Thursday. The deal could allow Liverpool to free up funds to move for Fulham striker Clint Dempsey, while Arsenal's Theo Walcott also remains a target. In the meantime, Liverpool have completed the signing of 18-year-old striker Samed Yesil from Bayer Leverkusen. The fee for the German Under-18 international is understood to be in the region of £1m.